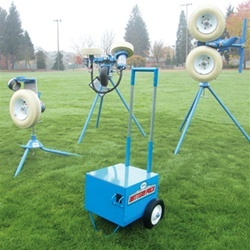 Runs ANY Jugs Pitching Machine (1 or 2 Wheel) up to 4 hours. Use indoors or outdoors. The JUGS Pitching Machine Battery Pack is the perfect alternative to a generator. It produces no noise or fumes and can be used indoors or outdoors. Comes complete with wheels and extension handle for easy transport. The JUGS Pitching Machine Battery Pack will run your machine up to 4 hours of continuous use. Easily recharges by using a standard 110v outlet.